What are your requirements? 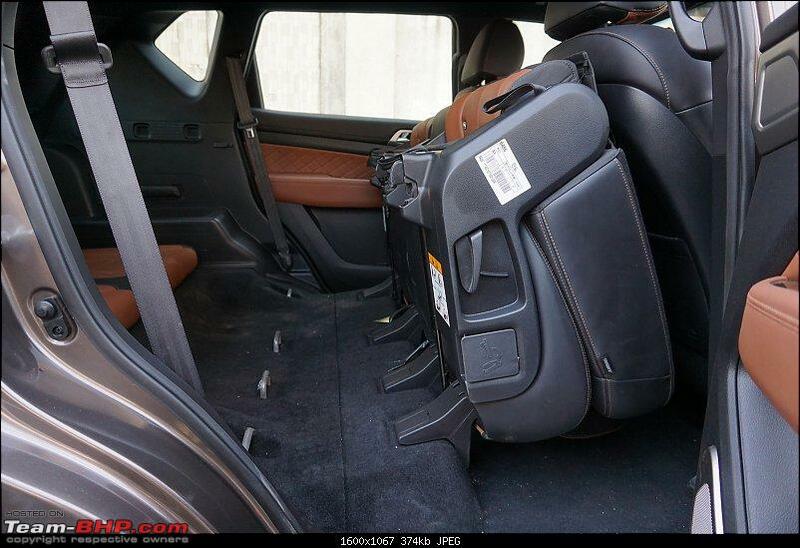 and besides the missing 3-point seatbelt for middle passenger, which other requirements were not met in the Alturas G4? 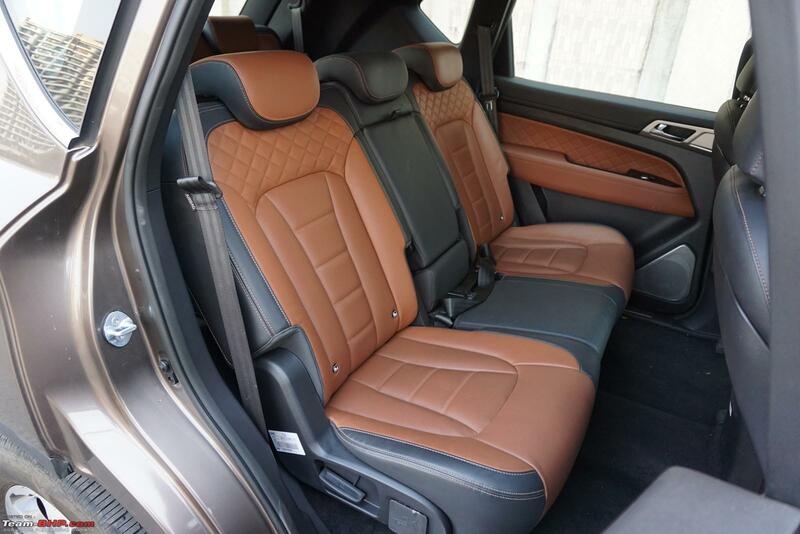 Just the 3 pointed seatbelt for middle passenger and a headrest to go along. Other than that, I am actually quite impressed with this beast. Probably the missing auto dimming rear view mirror but that is never a deal breaker. After going through the video, I completely agree with their judgement. Many reviews were pointing out that the car has a tremendous amount of body roll, well as per Overdrive, it is the Alturas which feels more planted and surefooted at higher speeds. 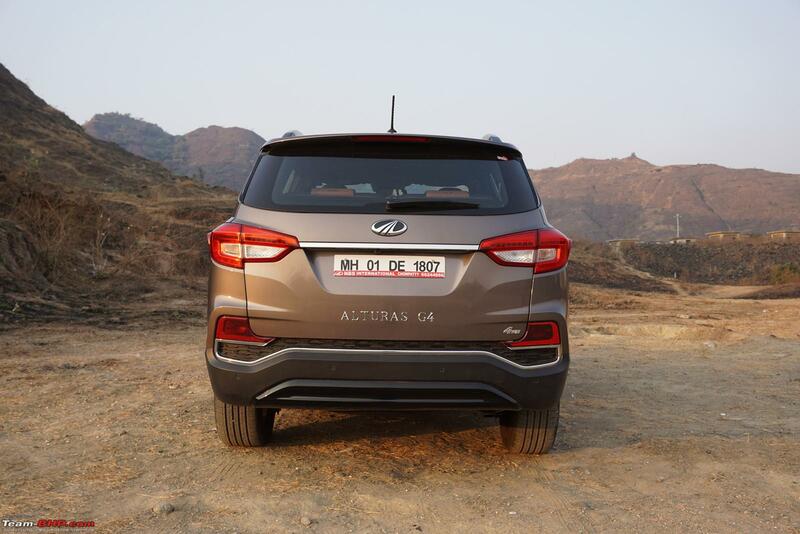 The reviewer says what tilts it in the Alturas favour is the 4 lac lesser price tag. Does that really make sense considering the resale value Toyotas command? There are more than 50 odd 'five years or younger Rextons' for sale on OLX between 7-10 lacs. The Fortuner of a similar age starts from 12-13 and in many cases costs twice as much as a used Rexton! Perhaps Mahindra's discounting can make the deal sweeter but I don't think most buyers in this price bracket would buy the Alturas simply due to the lower price tag! Rexton was dated in terms of the platform and design even before it was launched here. That is the reason they did not sell inspite of being substantially cheaper than the Fortuner or Endeavor. 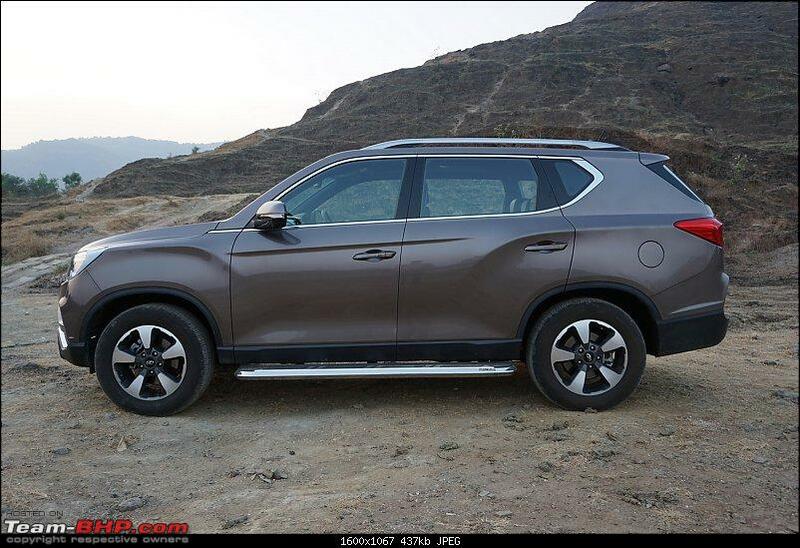 But the Alturas G4 is as modern as any other SUV. Resale value shouldn't be so bad. 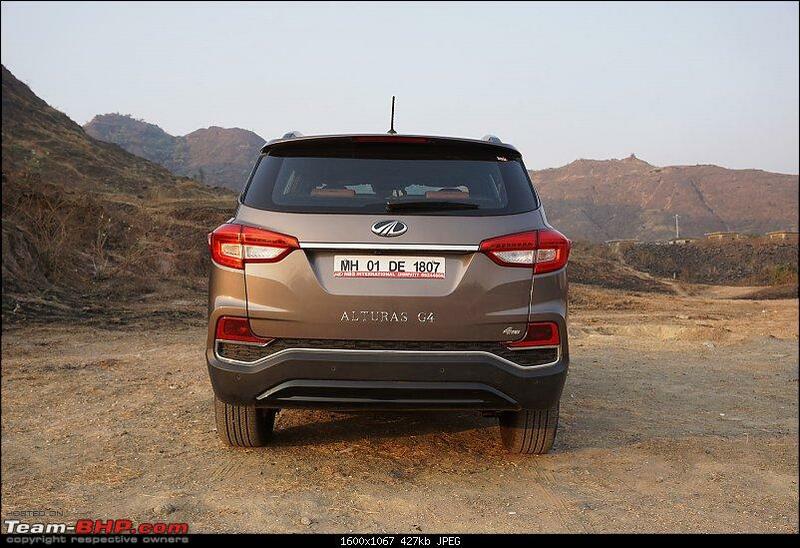 The reviewer says what tilts it in the Alturas favour is the 4 lac price tag. Does that really make sense considering the resale value Toyotas command? I for one believe that a better product may not always be the more sensible buy and vice-versa. Even I would not pick the Alturas over the Fortuner. Atleast not yet. But I would gladly pick the Endeavour over the Fortuner. That being said, I stick to my opinion that the Alturas looks like the better product overall. And price is definitely one big factor, but there were many other factors on which the Alturas came out on top. I have no reason to disagree with this. 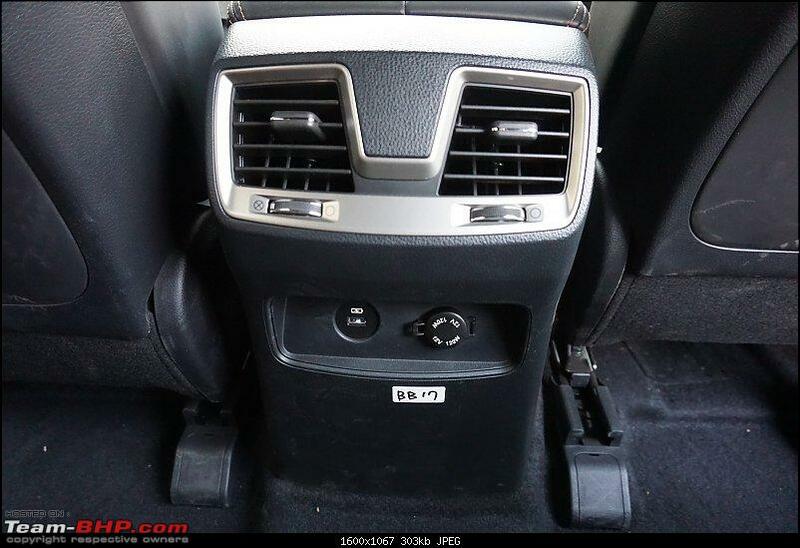 Rexton was dated in terms of the platform and design even before they were launched here. That is the reason they did not sell in-spite of being substantially cheaper than the Fortuner or Endeavor. But the Altura G4 is as modern as any other SUV. Resale value shouldn't be so bad. You might be right, but in 2013 when the Rexton went on sale in India, the Gen1 Fortuner was already a 10 year old model/platform! I for one believe that a better product may not always be the more sensible buy and vice-versa. Completely agree, I always thought the Fortuner was very flawed for it's intended Indian clientele (rich/upper middle class urban dwellers). I have not driven the latest iteration but my experience with the previous one left a poor taste for the price Toyota charged. 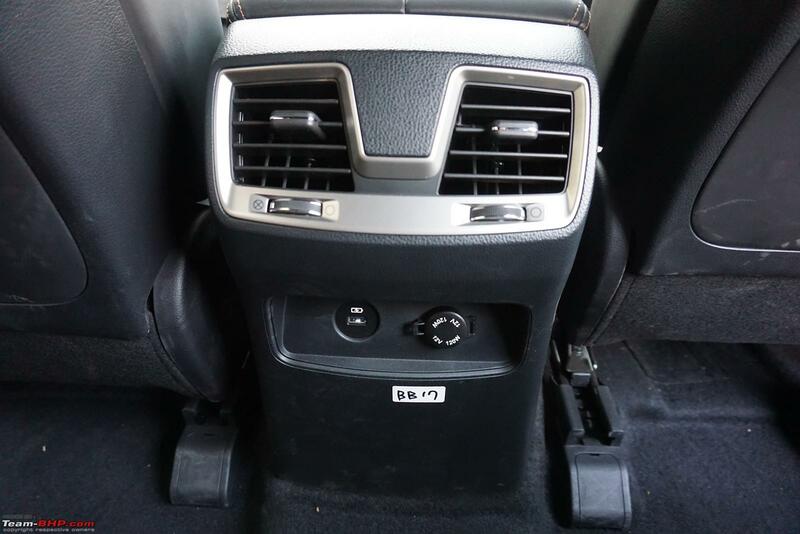 Poor ride and average interiors, the Innova was always the more sensible choice unless tackling serious off-road conditions. So perhaps dictating logic on the basis of a comparable product with a slightly lower price might not necessarily win the Fortuner bakths! I could be wrong, let's wait and see. When the Endeavour couldn't take away the Fortuner fan following (which is a big surprise and shows the credibility Toyota has built over the years), the Alturas shouldn't even think in that direction. 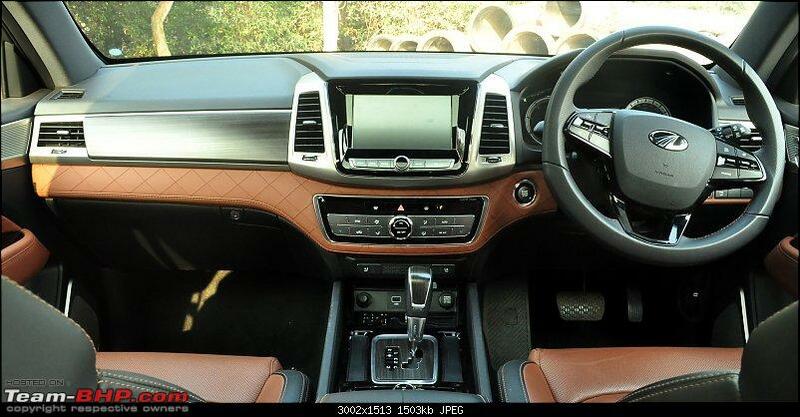 And you should drive the new Fortuner, its a totally different SUV compared to its previous generation. I own the prev-gen Fortuner but when I drove the current-gen I was taken aback. 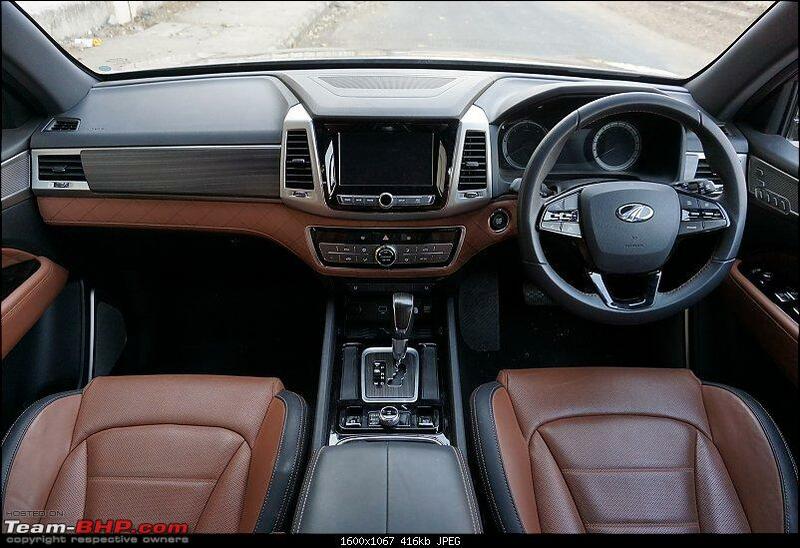 The truck-like crudeness is gone and it behaves much more car like now, whether its the interiors or the ride quality. 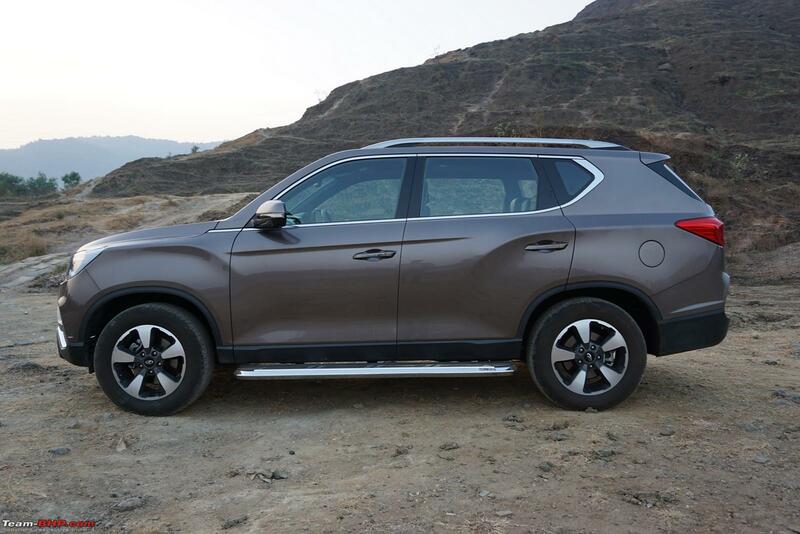 Overall, the current-gen Fortuner is leagues ahead of its predecessor. While many may continue to complain about overpriced Toyotas, they are here to stay and its going to take a lot more than an Alturas to make a dent in their sales. Lastly, the general public isn't as dumb as we may think. If Alturas turns out to be a better product and Mahindra's after sales gets better than Toyota or even at par, then no one can stop Alturas from becoming the segment leader. Look at Compass, when the product is actually good, it'll find takers who are willing to overlook couple other aspects of car ownership. It's actually quite rare to spot a Alturas on our streets here, except for the TD vehicle outside the Mahindra showroom, it definitely has the road presence and only if the pricing was tempting enough for a prospective buyer to switch his purchase from the fortuner or the endy. IMO if Mahindra does price it correctly there certainly would be a decent enquiries in their showrooms for the Alturas. I happened to see about 4-5 Alturas recently in Mumbai in a convoy. All were silver with black plates with yellow lettering. Couldnt find out what hotel fleet they belonged to. Could be for self-drive vehicle company too! I saw 3 different Alturas in the last 2 weeks. They are doing quite well in a small city! Hello everyone! Thanks to GTO, I had the Alturas G4 for a night and got to experience it for about 75 odd kms. Here are a few of my impressions:. First and foremost, the Alturas G4 is HUGE. Seems big and burly even when compared to the Endeavour and the Fortuner. Doesn't turn heads (not a looker), but definitely has road presence. 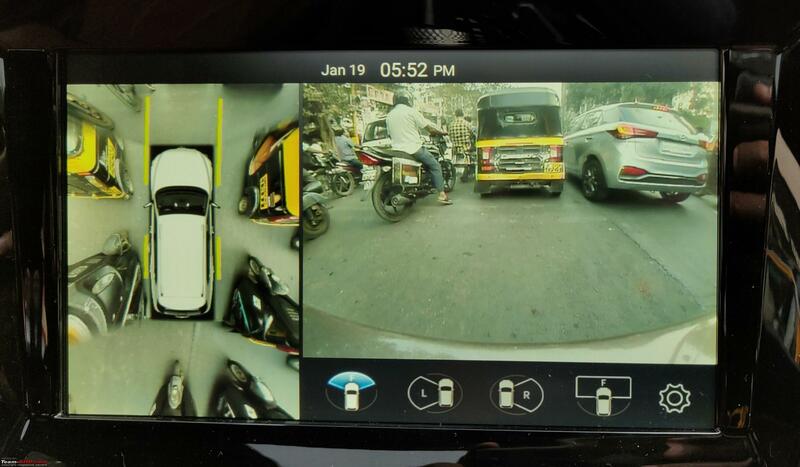 You simply can not ignore this SUV when it appears in your car's rear view mirror. Front and rear design is pretty modern, but has a distinct Korean (read Hyundai) personality to it in terms of design language. The side profile (especially portion behind the C pillar) is where the bulk of the car is pretty obvious and I would have preferred a bigger quarter glass to reduce that bulk. Currently it looks like it was originally designed as a 5-seater car and then they added 10-15 cms at the rear to elongate the car. The alloy-wheel design is too simplistic and is a lost opportunity to add easy oomph to the car. The SUV is so huge that even the 18 inch alloys look a bit on the smaller side. Doors are heavy. No panels have any sort of flex. The build is rock solid. 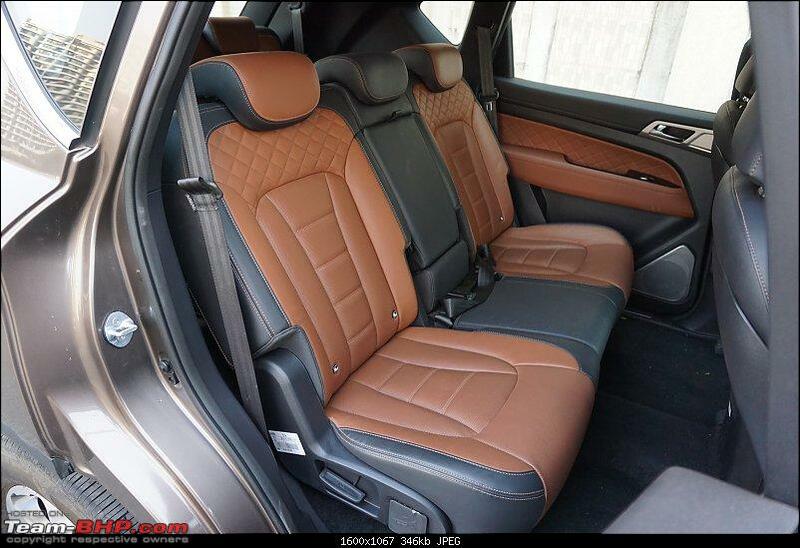 The interior comes as a really pleasant surprise. Its classy and premium. The choice of materials, textures, color-palate, the quality of switch-gear, use of soft-touch plastic at correct places, the fit and finish. All of that comes together brilliantly for a very premium feel. 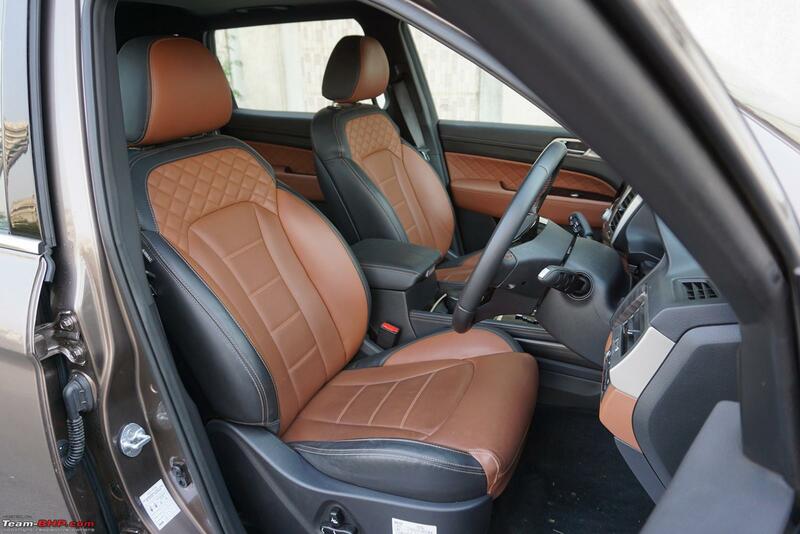 It is very difficult to find faults with the Alturas G4 interior. Even on ergonomics front, the front 2 seats are spot on. Its quite easy to find your optimum driving position. There is a commanding unobstructed view through the front windshield. The ventilated seats are just awesome. Possibly one feature that I would like to see in lower segments as well due to the sheer utility of it in Indian climate. 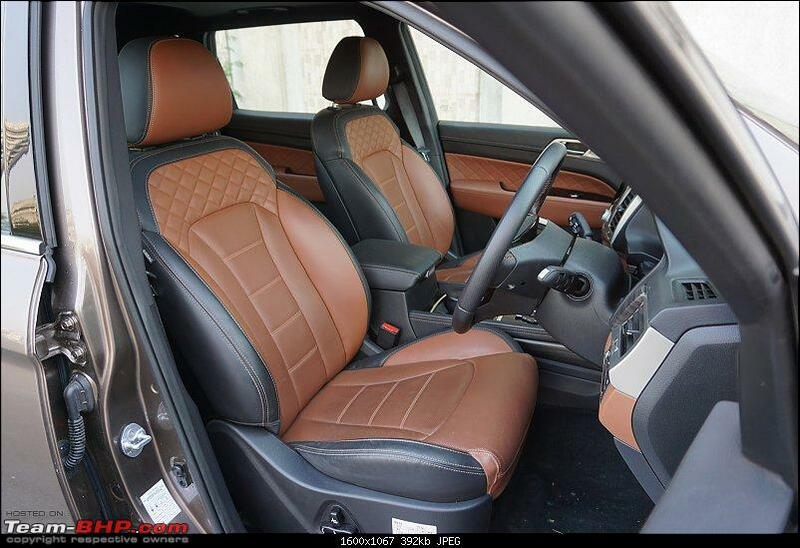 Although it gels well with the overall interior, I am not a fan of the tan shade of leather used in the Alturas. 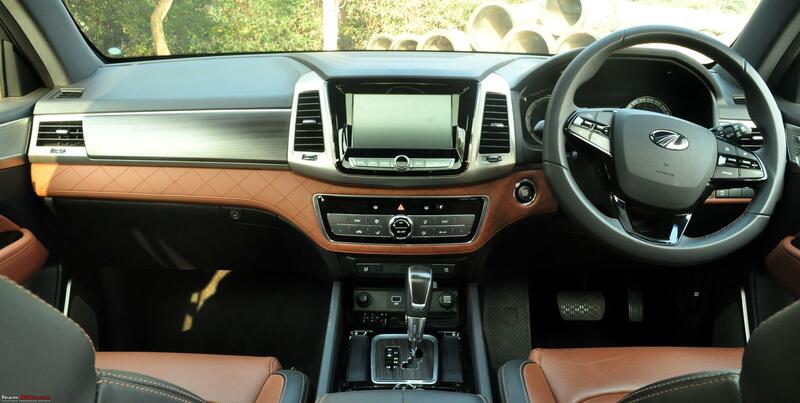 The beige on the international Rexton looks really nice (although not practical) and takes the premium quotient up a few more notches. 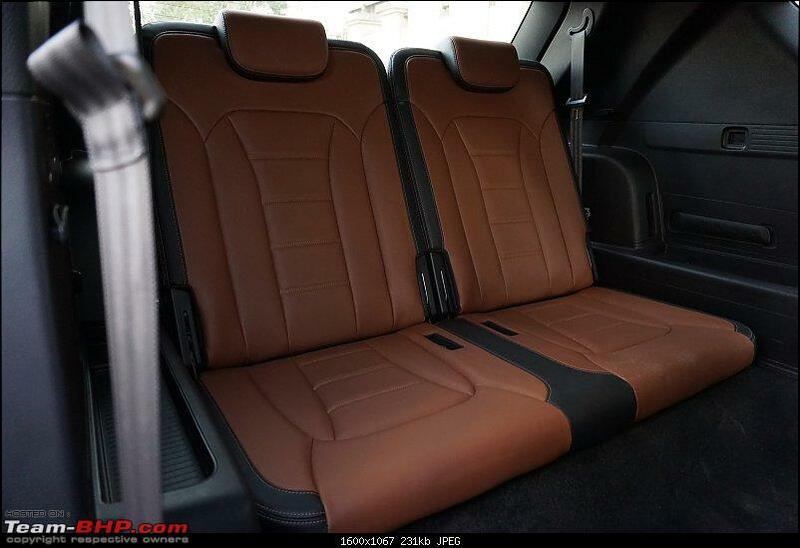 On second thoughts, even a complete black interior might have looked pretty neat in the Alturas. If I have to nitpick, I would have preferred a chunkier steering wheel. Its a bit thin at the top and a bit fat and flatish towards the lower portion. But you get used to it soon. The 2nd and 3rd row seats are below expectation. The 3rd row seat is plain ridiculous and possibly the worst I have ever seen. It carries over that tradition from previous generation Rexton. 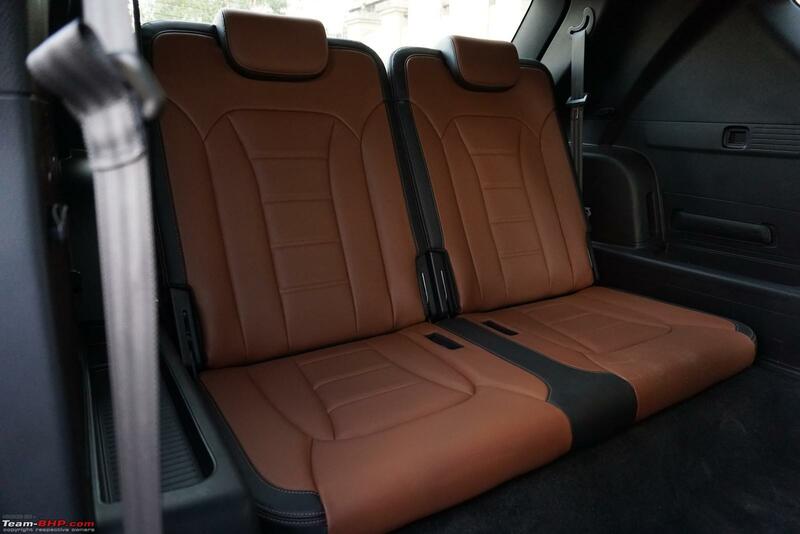 The 2nd row seats look inviting and super-comfortable, but when you actually get in those, you realize that the seat base is not long enough (too much of space between your calves and the front-edge of the seat). Also even for a 5'10" frame, there was sizable gap between my under-thigh and the seat. I am not sure, if the center arm-rest was broken in the media car, but it was slanting way too downward. The arm-rest on the door-pad (2nd row) is also placed higher than required and you would have a raised shoulder after resting your arm there. Not cool for an otherwise luxurious car. The ORVMs might seem a bit small for a car of this size, but they are perfectly functional. The foot-well is spacious with a XL sized dead-pedal. 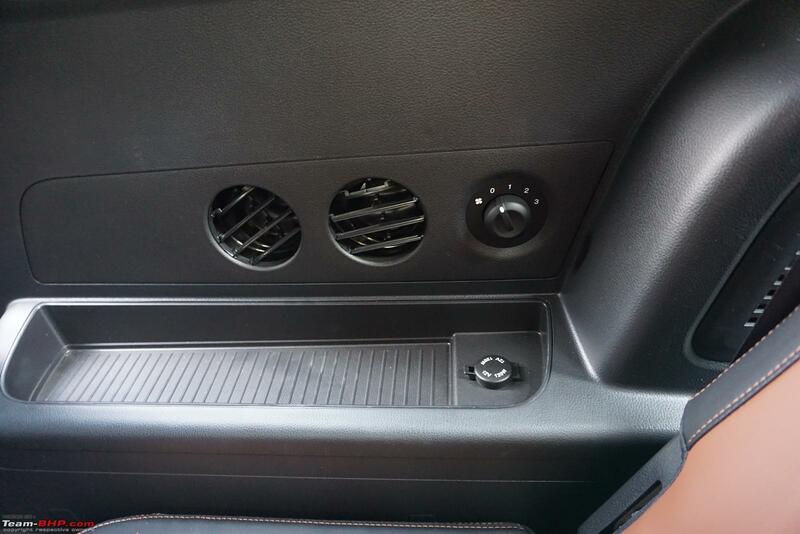 The center console is a very simple user-friendly design, not too many buttons and not too many complicated settings. Just the way I like it. Even the MID is pretty intuitive. Slot into D, lift off the brake pedal and the Alturas G4 creeps ahead as expected. The engine idles at 750-800 kind of rpm. A tap on the accelerator and the SUV starts picking up speed in a linear fashion. When driven sedately, the autobox upshifts around 1500 rpm. Keep the accelerator pressed and the SUV picks up speed at a pace in line with the expectations from the 180 horses under the hood. Go a wee bit heavy on the accelerator and the Alturas holds the gears longer (changing at around 2000-2200 rpm) and within a matter of seconds you are cruising at triple digit speeds. Even after driving the XUV5OO for close to 7 years now, it took me a few minutes to get adjusted to the sheer size of the Alturas when on the move. 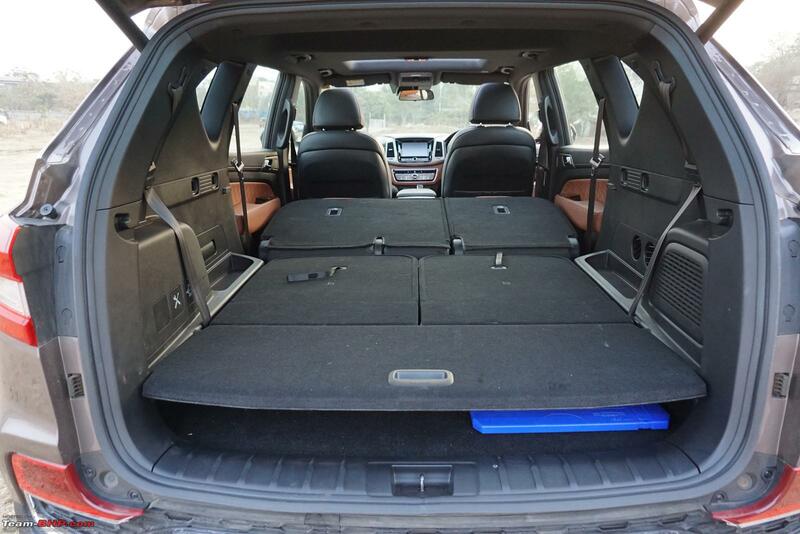 Once the SUV gets moving, the first thing that you notice is how quiet the cabin is. The 2nd thing that you notice is that the ride is stiff, typical of a large ladder-on-frame SUV, comparable to the Fortuner (not as nice as the Endeavour). You are always aware of the kind of road you are travelling on. Go over broken tarmac or the expansion-joints on the flyovers and there is a fair bit of jostling and tossing-round in the cabin. The suspension noise also intruded into the cabin much more than I would have liked. Overtaking on open roads is easy, as there are enough reserve horses ready to jump in even after 3000rpm. But the 7 speed gear box has a minor lag at the time of dropping gears. It feels as if the SUV hesitates for few milliseconds with a sudden accelerator input. After driving around for about 40-50kms, I gathered enough courage to weave in and out of lanes between slower moving vehicles. Due to the sheer bulk of the Alturas, this weaving in and out maneuvers ended up scaring the hell out of other road-users. High speed ride is nice and the Alturas could cruise all day long on highways. With the key in pocket, walk up to the driver side door and the ORVMs open after blinking the turn-indicators. Its as if your pet St. Bernard wakes up just by hearing your foot steps. Lovely! Open the driver side door and the driver-seat moves back for you to get in easily. Alturas G4 doesn't start moving at all till you wear the seat-belt (and all doors are closed). 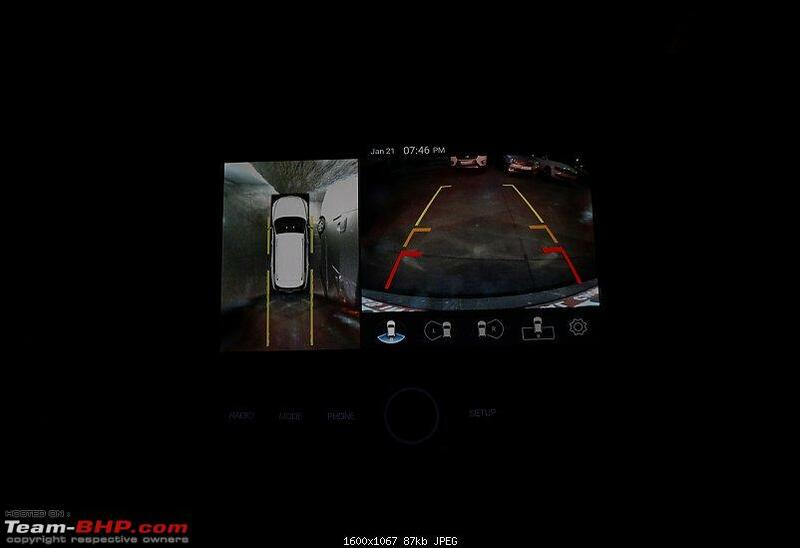 While reversing, the ORVMs tilt downwards and you can configure the amount of tilt for each mirror. Most of the User Settings menu from MID gets disabled while the car is in motion. No unnecessary distractions while driving. Super thoughtful! There is no sub-woofer, but still somehow (may be due to heavy build and thick non-flexing door panels) music sounds very good. I actually enjoyed listening to music in the Alturas. Come to a stop, shift the stick to P and open the door, the SUV automatically shuts off. Very logical! While reversing, the MID shows the orientation of front wheels till you straighten them. 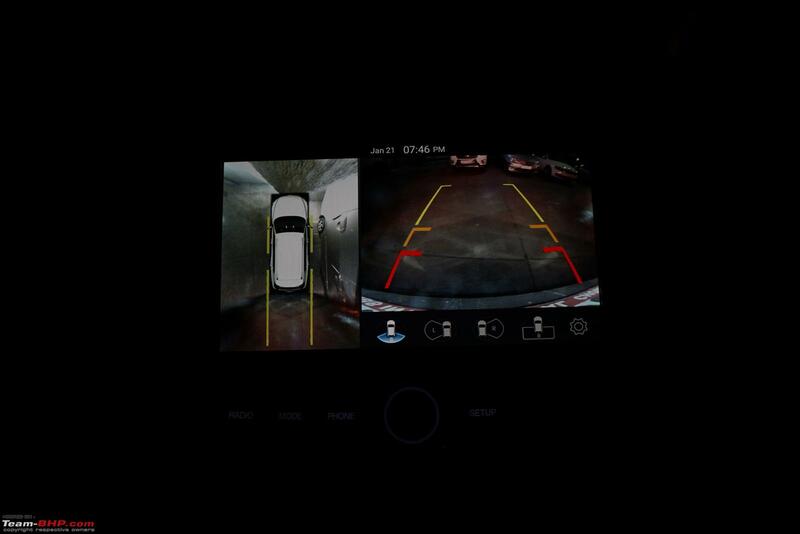 The car recognizes you when you approach the boot with the key in pocket and opens the hatch automatically. No need to break into a tap dance like the Kodiaq and the Endy. 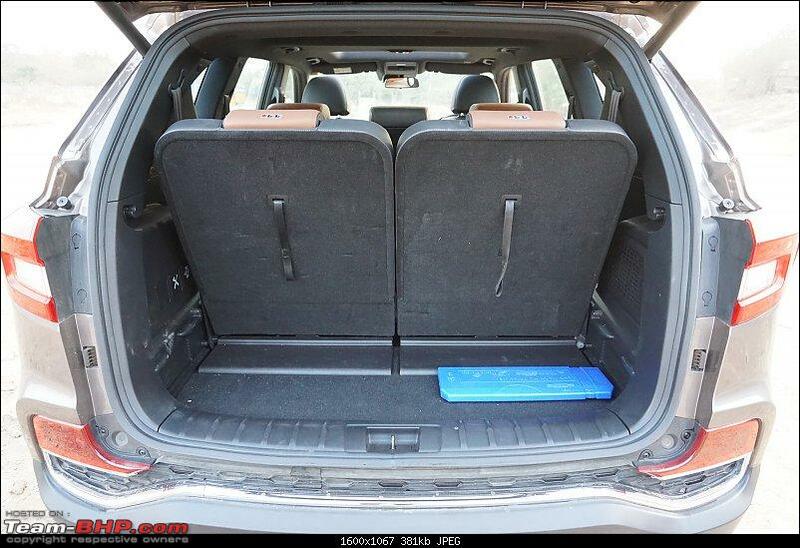 The grab handles on the B pillars are very useful while getting in the rear seat. 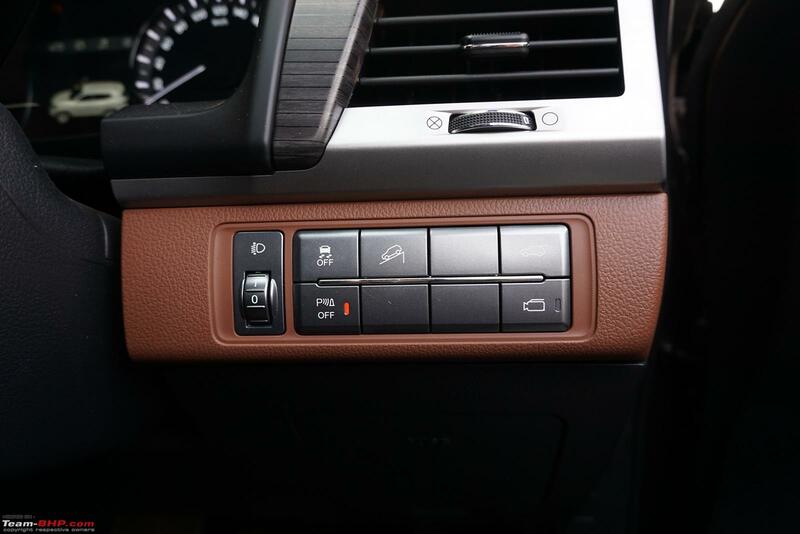 The electronic parking brake disengages automatically when you start driving. I love it when a designer reduces number of steps in a process. The Auto-Hold feature is super useful. Once the car comes to a stand-still at a traffic signal, it holds the SUV and you can take the foot off the brake pedal without fear of the vehicle rolling/creeping. Very useful in city! The ambient lighting or mood lighting is a simple narrow strip (at the base of the faux-wood insert) which you wont even notice when not lit up in the superb blue light. Looks really neat & classy at night! No auto-dimming IRVM (and may be even the ORVMs) for a 30+ Lakh asking price. You can not walk into the cabin. You need to climb in. For anybody with average height, the side-steps are a must-have accessory. Such a huge SUV and still can not carry 7 adults, something that a Kodiaq or even a XUV can do. The floor-mounted last row of seats are plain ridiculous. 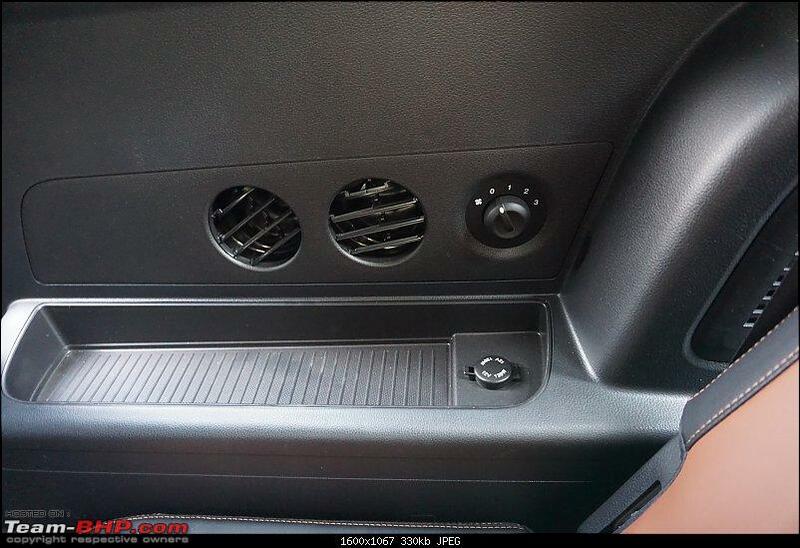 The last row has AC vents only on the right. After cleaning, the passenger side wiper needs to be placed back before the driver side wiper can be placed back. It gets obstructed by the other wiper otherwise. You need to stretch your fingers to reach the horn pad. Didn't like the tone and loudness of the horn either. The low-beam is white, the high-beam is yellow. Looks weird when both beams are on. The high-beam is not very powerful. 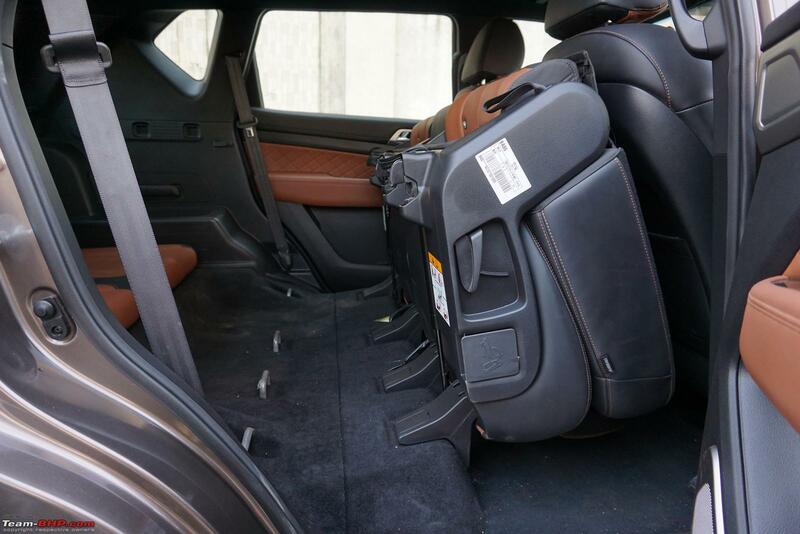 For such a large and tall car, the limited headroom on the driver side is surprising. 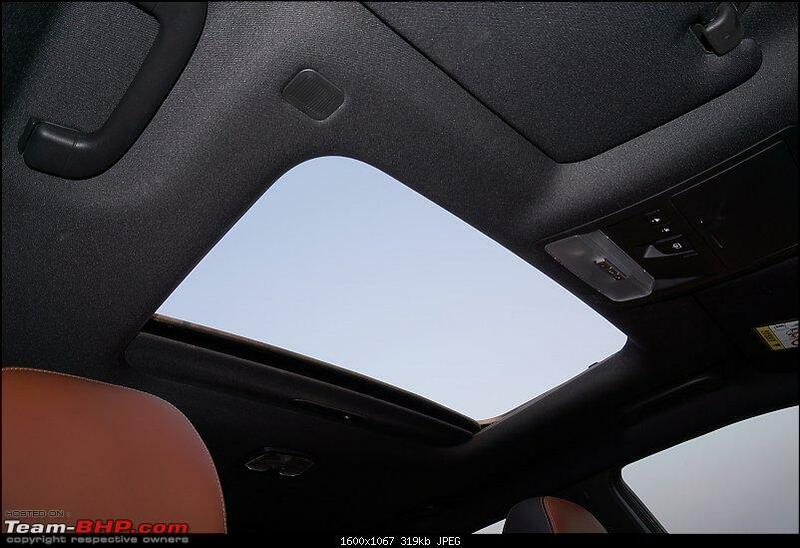 Most likely the sunroof frame has taken away some precious millimeters. I had high hopes from the 360 degree camera, but was disappointed. The way the 4 video feeds have been integrated into a single representation leaves a lot to be desired. Everything looks very distorted and the merging of the different feeds is nowhere near seamless. Very good, solidly built SUV. Really premium on the inside. No real complaints about how it drives and rides. Very typical of large body-on-frame SUVs. 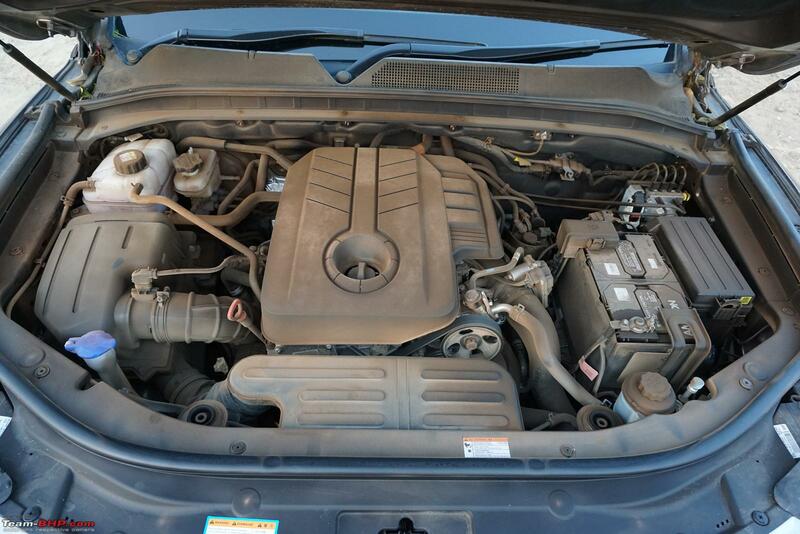 For a XUV owner (typically a customer who values features and VFM over brand name and snob value), there is still no logical upgrade in the market. 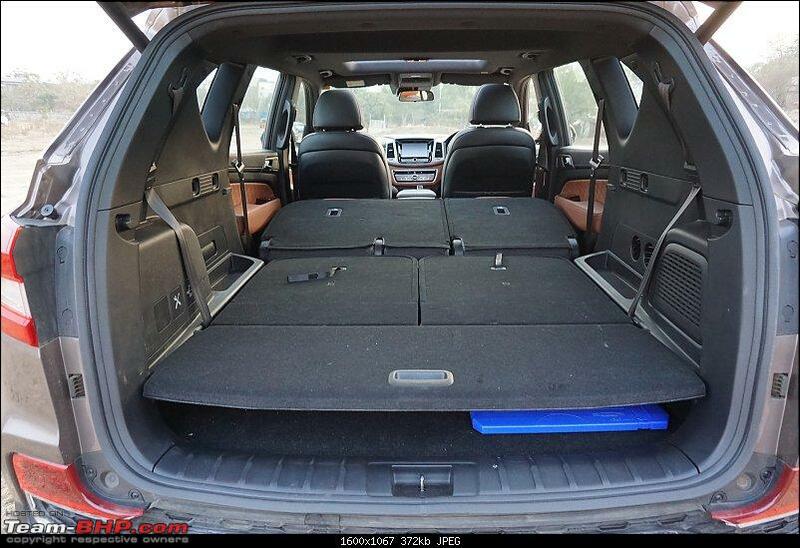 Lot of XUV owners had huge hopes pinned on the Alturas and were expecting a VFM package. But the pricing of the Alturas has disappointed a lot of them and most (if not all) have already backed out of considering the Alturas G4 as their next upgrade. 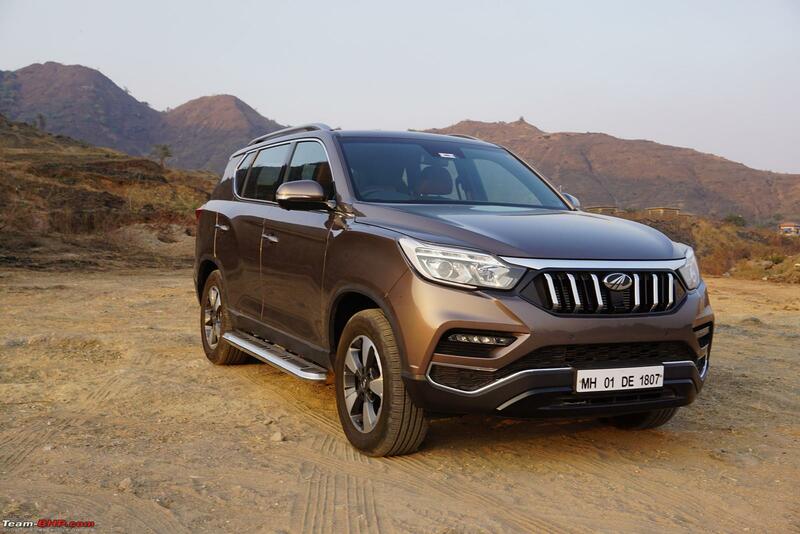 The Mahindra badge and the not-so-great first inning of the Rexton in India would make people stop and think multiple times before plonking in 30+ lakhs on the Alturas G4. Last edited by SDP : 28th January 2019 at 08:59. 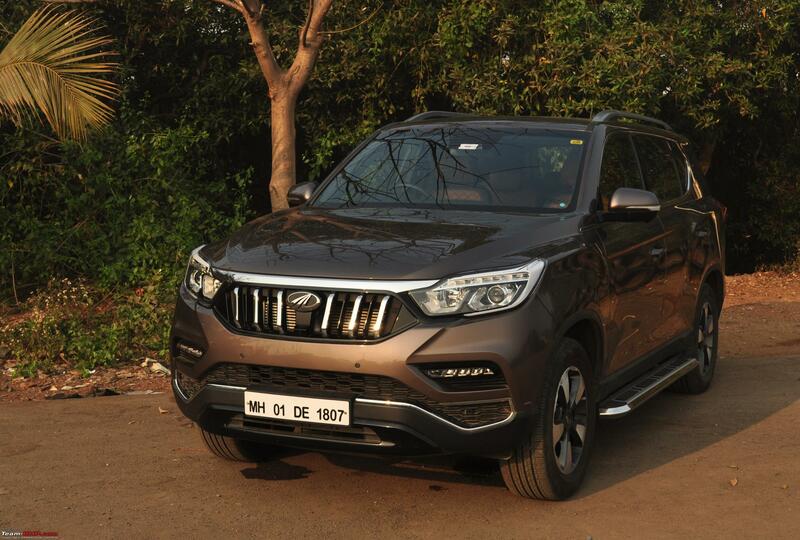 Here is a quick drive report of the Mahindra Alturas G4. 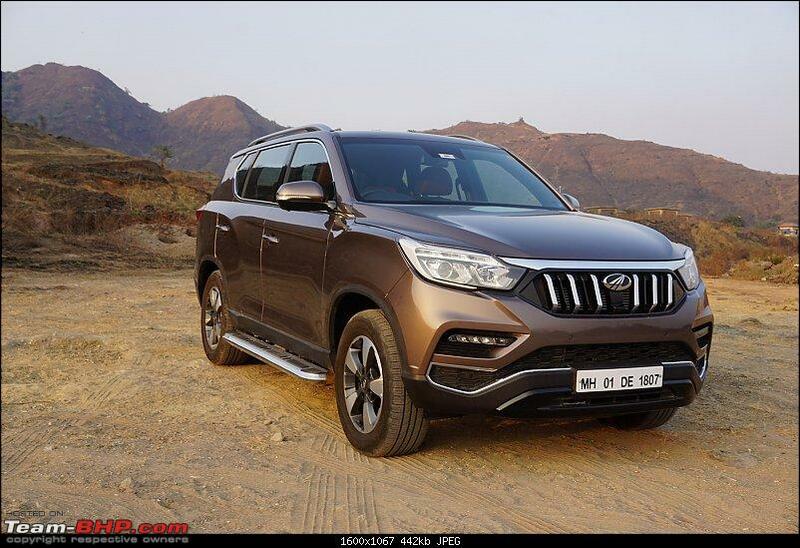 The Mahindra Alturas G4 is nothing but a rebadged SsangYong G4 Rexton (or second-generation Rexton). 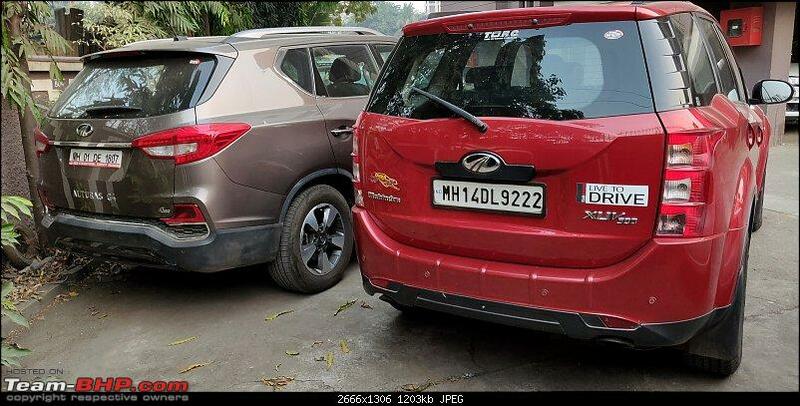 So, apart from the badging, grille and wheels, both cars look pretty much the same. With cuts and creases all over the body, we did not find the Alturas G4 good looking. I remember how I had hated the Toyota Fortuner when I saw it in pictures. But, when I had it for a few days, it grew on me and eventually I fell in love with its design. This was not the case with the Alturas G4 though. Rear-end is a not as aggressive as the front. Tail-lamps are LED units (except the reversing lamp and turn indicator). No foglamps have been provided. The ones above the bumper are dummy units. Use of chrome is restricted to the badging, a thick strip above the number-plate housing and a couple of thin strips on the bumper. 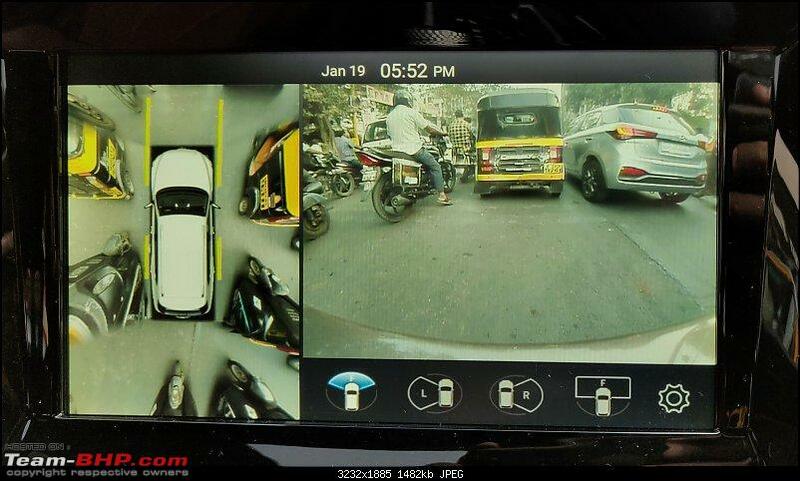 A reverse camera is housed above the number-plate. The bumper houses a honeycomb mesh grille like the air dam at the front, four parking sensors, a towing point and a black scuff plate. Notice how the words Alturas G4 are mentioned in large letters on the tailgate. It's quite a stupid name - Alturas. How many car names can you think of that end with an "s"? Sounds like a plural. Should have been Mahindra Altura. What is Alturas? With your foot on the brake, press the engine start / stop button and the Alturas G4’s engine starts and idles like a typical body-on-frame. There is some body shake and vibrations can be felt on the steering wheel and pedals. There is a buzz felt on the gear lever too. Lift off the brake and the Alturas moves forward effortlessly. 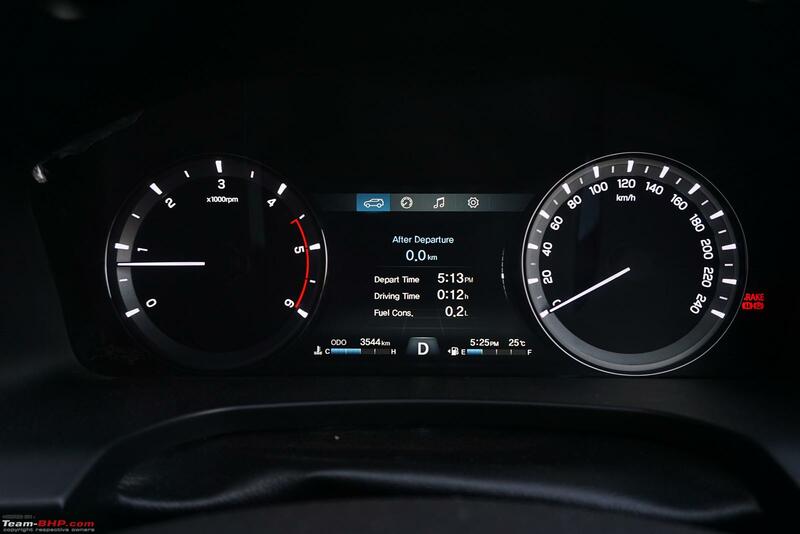 Throttle response is acceptable and the engine is quite happy to be driven at city speeds. 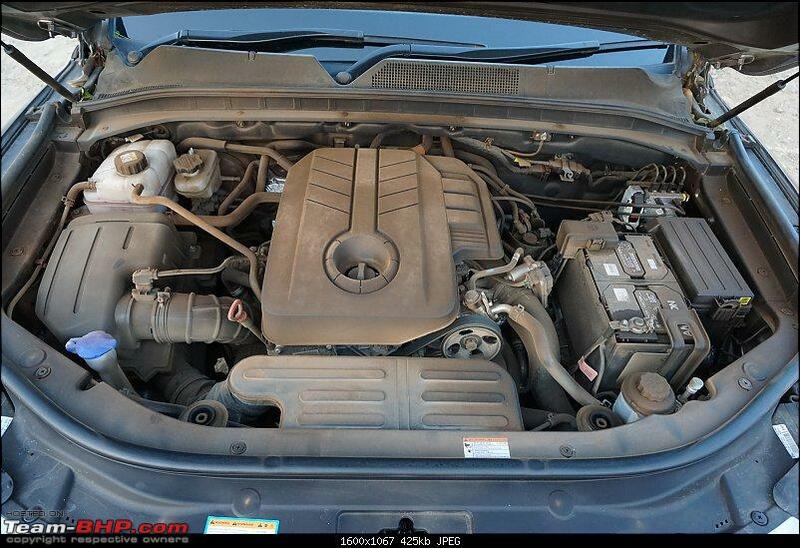 While there is very little turbo lag, the engine comes into its stride around the 1,800 rpm mark. Keeping up with city traffic is very easy. Driven hard, the engine revs to just 4,000 rpm (500 rpm short of the redline). While there is adequate performance available, do not expect this heavy SUV to set the road ablaze. While there is enough power to keep most drivers happy, the G4 is more of a cruiser than an outright performer. 100 km/h is seen at 1,600 rpm and 120 km/h at 1,900 rpm. The 7-speed automatic gearbox is smooth. Gearshifts are barely noticed by anyone other than the driver. It's fine when you build up speed gradually. 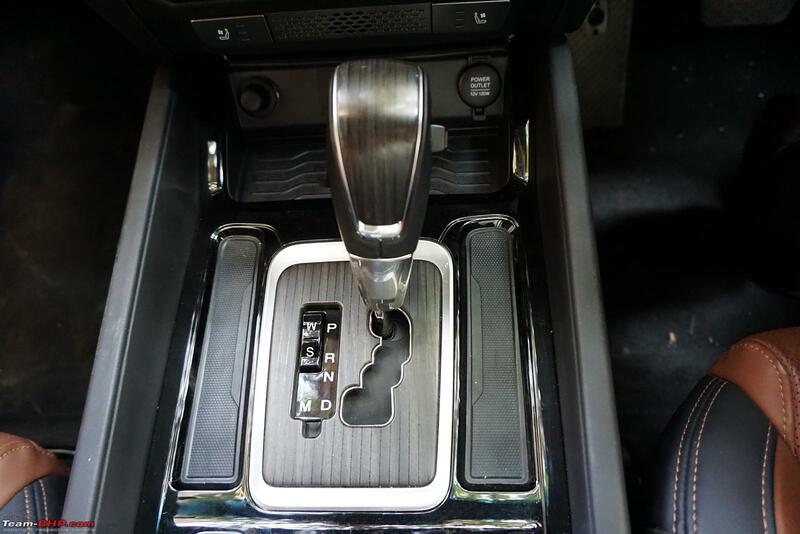 However, it is not a quick gearbox by any stretch of imagination. When driven hard, its shortcomings are highlighted. Kickdown takes well over a second and a half. Forget DSGs, even some AMTs feel faster. So, while overtaking on undivided highways, you better plan your move well in advance. 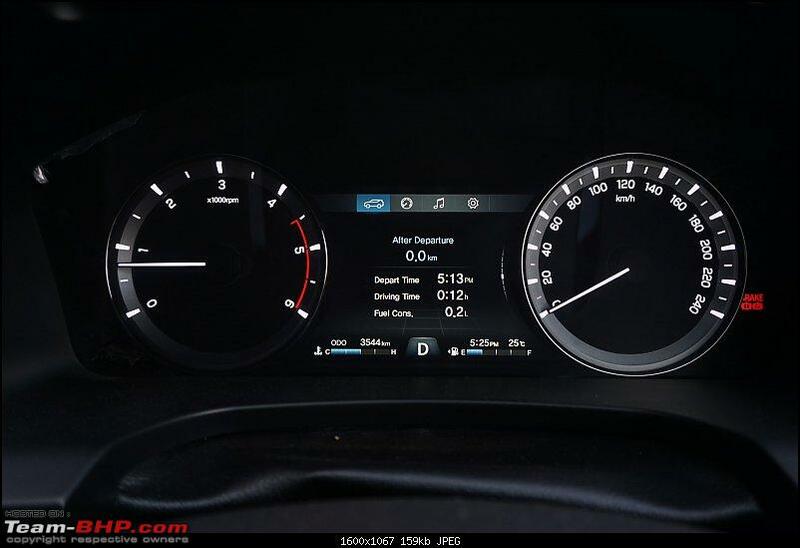 There is a manual mode available, but even with that, it is not a quick shifter. 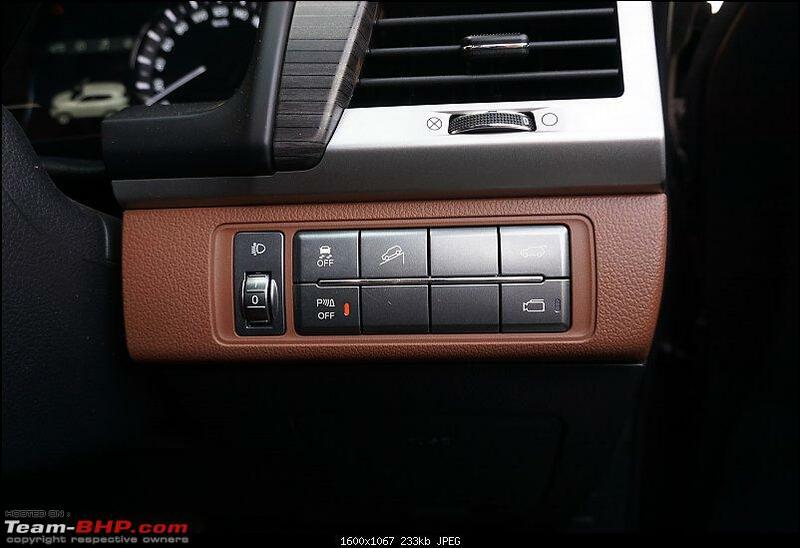 Besides, the M mode is operated by an irritating little switch on the right side of the gear knob. Just driven at 20 - 30 km/h and the first impression is that the ride quality is very body-on-frame Fortunerish. You can feel everything there is on the road. You always know the kind of road you are driving on. It is not plush at all. At low speeds, there's a fair bit of cabin movement also - even at 35 km/h - on a relatively smooth Cadell Road. At high speeds, the ride quality is compliant, but that's it. It certainly can’t be called plush. You feel all the undulations on the road. Where it shines, is in the rough. The vehicle simply flies over the rough stuff. An unladen ground clearance of 244 mm ensures that the car does not scrape its undercarriage anywhere. Straight line stability is good. But, like most tall SUVs with a body-on-frame construction, there is a good deal of body roll in the corners. Do not try to hustle this vehicle through corners like a low-slung sedan or a hot hatch. It’s just not its forte. The steering is very light making driving in the city is very easy. However, we cannot say this car is ideal for the city. The large size and poor rearward visibility coupled with a turning radius that measures 5.5 m, makes it quite handful. At high speeds, the steering does weigh up, but it is devoid of any feel. The brakes do a fair job of stopping the vehicle, but they are not exceptional. Again, there is some nosedive experienced on hard braking. Coming to NVH levels, the cabin has very good sound insulation. The outside world stays outside. You can literally notice it if you roll down the window and put it up. Exterior sounds just don't filter in. Wind noise is non-existent at legal speeds and road noise and tyre noise are average. The engine, however, can be heard if revved hard. Thanks for the initial impressions, Aditya & SDP! 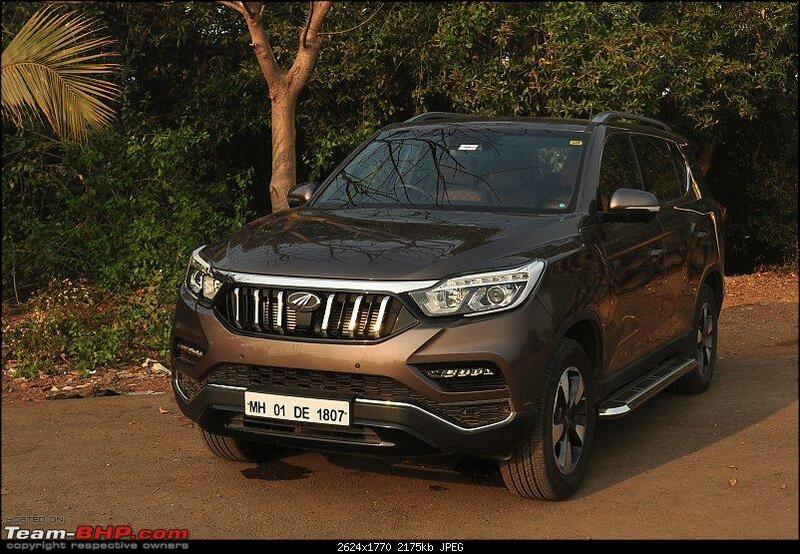 A competent SUV, but overpriced by 5 - 7 lakhs. Whoever saw the vehicle and / or drove it liked it. But when they heard the price, the unanimous answer was "why wouldn't I just buy a Fortuner or Endeavour?". 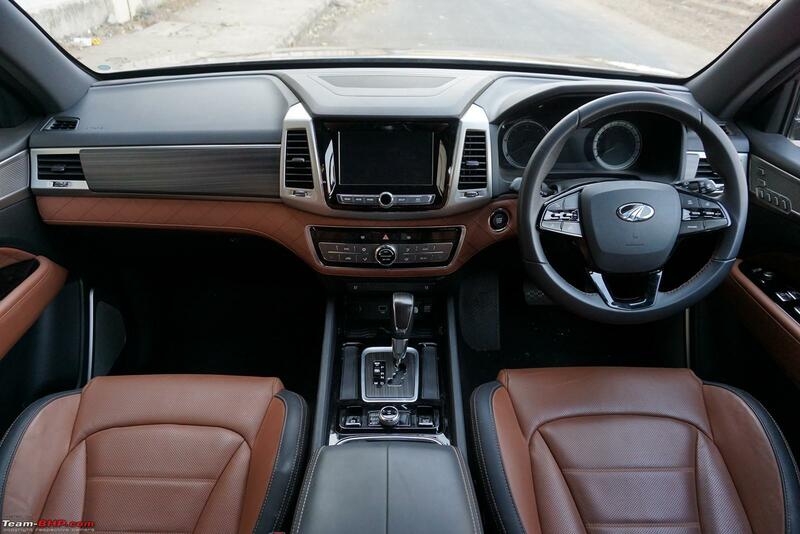 Nice engine, smooth transmission, likable cabin, lots of features & typical body-on-frame ride quality (compliant, but not plush - reminded me of the Fortuner). The car will help the Mahindra brand more than the Mahindra brand will help the car. 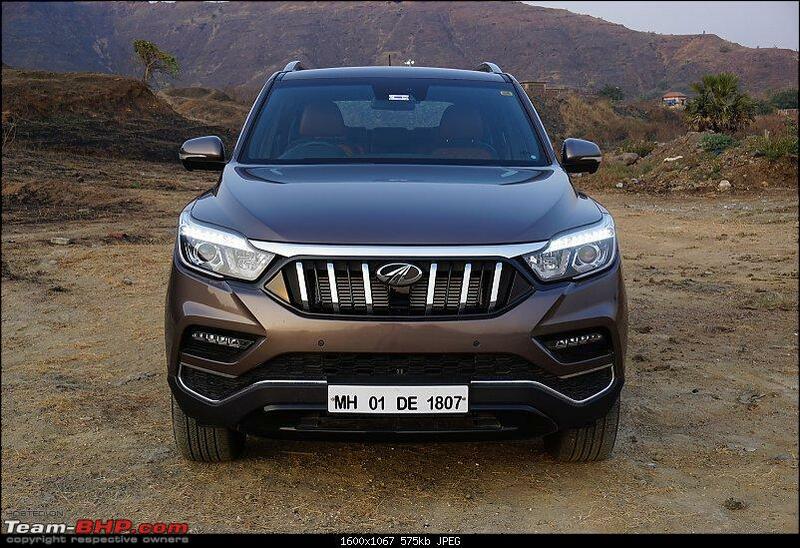 I wish Mahindra had gone aggressive with the pricing by seriously undercutting the Fortuner & Endeavour. At the current price, it'll have just a handful of takers. Remember, this segment isn't as "price sensitive" as it is "brand sensitive". And even if you pay more for the Fortuner, you'll easily recover the difference in resale. My favourite remains the Endeavour 3.2 . Last edited by GTO : 27th January 2019 at 14:23. The car will help the Mahindra brand more than the Mahindra brand will help the car. I believe Mahindra knows this and it could be the reason for such pricing. They probably are looking to use this product to help their brand and steadily position themselves at a premium in other segments. The XUV3oo pricing could establish or bust this hypothesis of mine. Just came back from the test drive of Alturas G4. My thoughts are in line with others. Worthy contender in the segment but Mahindra should have priced it lower to get more footfalls. They have sold 24 Alturas in Bangalore with many more lined up for end of this month.